This entry was posted on Wednesday, May 4th, 2011 at 7:28 am	and tagged with Dziga Vertov, Man with the Movie Camera, Soviet Montage and posted in Essays, Film Reviews. You can follow any responses to this entry through the RSS 2.0 feed. I loved MwtMC, but I wonder if the influence of the Soviet Government served as a muse for Vertov, or did it act as a restrictive. Did he benefit from the structure and limitations? I guess it may not be relevant, because it would be possible for a Soviet Montage style film to feature non-soviet subjects. You ask an interesting question, Gus. I think it’s probably true to say that the Soviet government acted as both a muse AND a restrictive for Vertov (it’s just a matter of trying to figure out the ratio). MWTMC certainly wasn’t the kind of movie they wanted him to make even if he intended it to be a tribute to the glories of his country. It is, of course, possible to love your country while simultaneously disagreeing with your government; ask any red-blooded American who protested our criminal and insane invasion of Iraq. I saw MwtMC at Ebertfest last year with the Alloy Orchestra providing the music/score. It was a terrific experience. Also, there was a wave of creativity in the arts at the beginning of the revolution, inspired by what was perceived as positive change (few had any love for the Czar). It was an era of experimentation and innovation in painting and fine art as well as theater and film, which was actually fostered under Lenin. As a matter of fact, Vertov took his name “spinning top” as a way to capture or comment on the excitement of the times. After Lenin’s death, the atmosphere completely changed, and the arts and artists found themselves in a completely different situation. In short, I would say Vertov benefited by the socio-political changes at first but it didn’t last long. Suzi, great points about the montage-style organically growing out of the socio-economic climate of the time. I would love to see this with live accompaniment by the Alloy Orchestra. My fear is that the new restoration is going to be released on blu-ray and dvd in the best possible image quality but without the Alloy Orchestra score! As much as I would want to agree with the purpose of the film and the direction the experiment took, I have to say this type of film would not seem like something new and abstract in our day an age. To the exposure of reality TV shows to YouTube vlogs, many of the same techniques of cutting to place to place all in our day is exposed to our eyes more than we like to believe. The elements of the film that were seen as art I felt were random shots to fill in time. I didn’t connect to the film but found some moments of contrast in everyday life were a nice touch. Jacqueline, even though I told you your response didn’t need to be as long as a regular screening report, your remarks here are still way too vague and I can only give you half-credit. What you’ve written could’ve been written by someone who paid no attention to the movie and didn’t read my blog post. You need to at least show me that you’ve seen Vertov’s film and ideally also say something of substance about it. Further, even if you didn’t personally care for the film, your assertion that it doesn’t seem “new” in our day and age was disproven by the reactions of some of your classmates, one of whom you heard announce that it was the “greatest thing” he’s “ever seen,” as well as the 2012 Sight & Sound critics’ poll that I mentioned in class (which placed it eighth on the greatest films of all time list). Man with the Movie Camera has proven itself to be an important and influential work, one that is still of enormous interest today. It’s up to you to show me that you understand WHY that is – even if it’s not to your personal taste. I will gladly give you more credit if you would like to rewrite your response to include a discussion of the filmmakers’ actual use of montage editing as discussed in class and in your textbook (preferably backed up by a specific example or two from the film). Thanks! I feel that the theme underlying Man with the Movie Camera is more than a mature take on the portrait of truth and beauty that is “national cinema.” The cuts may be fast throughout, but the pace of the film is not one set rate. As the movie progresses, civilization swells. More people, more industry, trolleys juxtaposed on top of trolley on top of trolleys. By the end of the film, the streets are so full of chaos the buildings topple over, as if the basin is overflowing. The entire time the camera shows both sides of the coin. I mean, the Kaufman literally turns the camera around in one shot, and a contrary view is depicted in the next series of shots. The rich and the poor, death and birth, luxury and poverty. When I watch MwtMC, I see chaos, civilization rise, and authority comes in to shape it. Authority comes in to direct traffic. And from control- luxury. But also we see the cost of luxury- turmoil of the lower classes can be cultivated into industrial production and wealth for the authorities. There’s a scene with a car full of well dressed, jazz age looking women zipping around the city, shots of Kaufman in another car filming the first car (shot from a third, unseen car), and, my favorite part, one of the flappers emulating the cameraman, cranking invisible film through invisible sprockets. From this, I take a step back. Sure, there’s an audience IN the film, they’re inarguably a part of it, but is the audience I’m a part of also a part of the film? The camera is the eye of the film, and the editor is the mind, seeing all sides and then assembling it into a story. The camera/eye is in the city, in the film. And they show the editing in the film, but the actual editing, the assembling of the movie is something that exists outside of the content of the film itself. Dig? So am i, the audience, outside Man with the Movie Camera, but not separate from it. Arpad, I like your assertion that we, the viewers, are part of the film as well. (In Soviet Russia, movie watches YOU!) This idea is most pronounced in the lovely prologue, which, lest we forget, takes place in a movie theater: the patrons filing in and waiting for the movie to start mirror our own position as spectators waiting for The Man with the Movie Camera to begin. And, of course, the film ends in the same theater (the serpent swallowing its tale!) while the patrons are watching shots on a cinema screen that we have just seen elsewhere in the film (e.g., Kaufman cranking his camera while riding a motorcycle). The woman emulating the cameraman is my favorite moment in the film — and one of my favorite moments in any film. I believe that the MwtMC underlines the hidden beauty of everyday life if we make ourselves into a silent presence that just observes then we would be able to see the beauty and complexity of the world around us. We go about our lives with one set routine, wake up, get ready for work/school, come back, eat and sleep. I believe that the montage editing allowed for a concise depiction of how the city just turns on with the rise of the sun. The people within the city act as gears, cogs, and often times as catalysts to get the city rolling like a steam engine. The editing created a quick fast-pace simulation of a machine doing several things quickly which shows the population working in harmony. The camera used by Vertov’s brother is that presence because we get to have an all-seeing view of the world, not matter what is going on. We see several shots of where numerous things are taking place at the same time and we get to see many of them. For example, we got to see how a woman got ready in the morning, similarly we saw the buses and trolleys rollout of their stables. Another great example of how the camera was the all-seeing eye, is how we saw the montage of the marriage/divorce, life/death. A couple was getting wed, then it was followed by the scene of a woman weeping at a grave, then back to a couple getting divorced and then a woman giving birth. The birth scene was quite a unique experience for me, because I have never seen anything like that, and honestly I was a bit like “whoa.” We see life beginning with the birth of the baby, death with the woman weeping, love with the marriage, and divorce. The camera placement was very elaborate and purposeful. This made a statement about how the camera is acting as a governmental eye that monitors everything. For example, the camera was placed up on a smoke stack and between trolley carts. This showed that any space were being monitored. What I thought was surprising was the people and how they interacted with the camera. Some of them did not care about it. I believe that Vertov used the montage editing in order to preserve the natural beauty of the city rather capturing the population acting differently in front of the camera. There were parts where the public knew about the camera, but that added to how the audience also played the role in the movie. I absolutely loved the film, and the score for the film was absolutely perfect. Man with the movie Camera is no doubt a masterpiece. The film editing and cinematography was ahead of its time. I honestly was not expecting so many different film techniques I saw in the film because of the time in which it was created. For example, a lot of superimpose was used, like in the shot where the human eye is superimposed on a camera lens eye. This creates meaning that the eye of the camera is the eye of the director. The vision of the director is captured by the camera. Another really cool technique used was the stop motion scene. It was done flawlessly! I’ll admit, I’ve always been a film noir, pre-code, French nouvelle vague, kind of girl but I am definitely looking into move Soviet montage films. Well, we are skipping over pre-code Hollywood tomorrow to delve right into screwball comedy but film noir and the nouvelle vague are coming up soon! After reading Prof. Smith’s response to the movie, I had a better idea of the meaning of the movie. I understand that the shot lengths and the montage sequences have a purpose. It is interesting how Vertov used shots to contrast the “humane portrait of a teeming metropolis” and how we live everyday as Prof. Smith mentioned in the response. I also appreciated how Vertov gives life to the camera, music, city, and the people; while the time passes the four subjects follow a rhythm. The people and the camera open their eye and the city starts to go on (machines, cars, people start to work while the camera operator and the editor are working as well). The “teeming metropolis” in the film (which is not one city but three made to look like one) is very similar to Chicago in the present day, no? Vertov’s use of montage creates order out of the chaos of urban living — and gives it a musical rhythm besides! Man with the Movie Camera is a very interesting film from a technical and artistic point of view, yet I found the movie dull and hard to watch. I would say not only how much this film helps us understand the importance of shot structure and imagery, but also story and pacing structure as well. Yes, the uses of metaphors and side by side imagery is spectacular, even to this age, but the pacing of this film as a whole doesn’t seem to stop and, to my experience, left me lost almost half way thought the film. A story in a film really helps people not to get lost in a flood of pictures. I often found myself getting lost because of drastic changes that were unbenounced to me and would cause me to think way more into the shot, which made me get farther behind on the film as it progressed. This really shows me that you need to find a balance in your film and not to strictly stick to one technique over another. But this being said, I do still consider this a masterpiece, Mr. Smith, but I don’t fully agree that it will hold up as well over time. We have the same techniques used in a lot of films, even in our home movies and low budget TV shows. Heck, some directors and producers use these techniques as a crutch to fill in time for their videos. I really don’t think this film will be remembered as fondly as other of its era. It most likely will be left in a display case, gathering dust, being marked as turning place for film history. Which is not what this film or director deserves. You don’t think it will “hold up over time”?! Well, it’s been doing a pretty good job for the first 84 years! Zach, MWTMC has continually been revived, re-released and written about ever since its release in 1929 when most of the OTHER films of that era have already been forgotten about. Your comments here emphasize your own subjective response too much and don’t really tell me anything about the movie itself or Vertov’s use of montage editing. I understand it’s not the easiest movie to watch (especially if you’ve been weaned on Hollywood) but just because you are only used to watching movies that tell stories does not mean that every film “needs” to tell a story. Man with the Movie Camera was really surprisingly amazing! At first i did not see the point in watching a bunch of small clips of random stuff. Well at the beginning, in my sense it was random clips being collaged together. Then after keeping up with the movie, I realize the point Dziga Vertof was trying to make was really simple and straight forward. As the movie kept going all this thoughts started popping up in my head. This movie, I believe, was made to the public off course, but since this movie has so much going on is really easy to take different points off view. One person can say something about it and another person can see something else in the movie. He used something called montage scenes meaning he edit many scenes to compress the informtion. That was what made it so fascinating. It was going by so quick that you could not have been bored watching this film. I really think that Dziga did an amazing job in making this film. It was well done and very inspiring for many people like myself. Before this film was made, he was a documentary film maker. He tried incorporation his skills in this movie and it was a success no doubt about. I’m glad you say that you came to realize it is “simple and straightforward.” That side to it is definitely there! I think a lot of people assume there’s a point that they’re supposed to be getting but aren’t and this makes them frustrated — when, in reality, they’ve “gotten” what there is all along! Dziga Vertov’s Man with the Movie Camera is a spectacular display of the montage filming technique. At first glance, the film left me questioning the meaning behind the film; in a modern film era of Hollywood-esque, story driven films with large explosions or gooey love scenes (and sometimes both in the same film), a film such as Vertov’s can often confuse the audience. With no story and no main characters, I was left asking myself whether there was a point to the film in whole. I believe the lack of narrative develops the meaning of the film, as the film tells the story of a body of people as a whole. What Vertov does, is rather than telling the story of one man, or even a group of people, he tells the story of a family, a culture, a well oiled machine that works day in and day out without fail. His rapid use of editing leaves very small emphasis on a single person, which gives all of the faces in the film a symbolic meaning, as the film shows that this city could be anywhere, with any people. The universality of the film allows it to be adapted to any culture, as we all face love, death, birth, marriage, divorce, entertainment, government influence, and even sports (depicted in the last half of the film). People have stated that the film is had to adjust to because of its vague and general concept, but I believe this concept is the reason this film is so fantastic; it allows a connection to any and all persons, despite culture, despite beliefs, despite being almost a century in the future, I could look at this film and see the story of not just one city, but any city, busy, crowded, but despite all this, still breathing, growing, and prospering. Okay in the film MWTMC, I was very much in love with the composition and as a photographer I have seen a lot of what he captured in his films as stills. One of the most common I have seen is the lense of the camera or taking a photo of someone taking a photo. Although it is super played out in current times. I absolutely love that he showed us the connection of camera and man and although I am not a cinematographer I can still relate to how fun photography can be and the way he compared the opening and closing of blinds to the opening and closing of the woman’s eye when she awakes simply blew me away. Because I feel a lot of todays trends in photography and cinematography makes us feel that those shots are knew cool and hip but infact are a lot older then we realize or our even shown. And that also saddens me just how much people just copy and paste ideas and even the bit of the stop motion of the camera I had NO IDEA people did so early on and how not new that technique is. But for me I feel that hip people play on these ideas as if its their own and its NOT! So I really appreciate watching the film because it really isn’t appreciated in current modern times in my eyes. I’ve always felt that things of this nature that show the beginning of art should be taught early on. I went home after that film and told my bf how angry I was at how society and media plays out on ideas that aren’t originally theirs and don’t state or reference where techniques began and how we learn later on. I honestly felt lied to by a lot of artists I know. Very true statement. Man with the Movie Camera is a very well done film for its time. Say if it was made recently it wouldn’t be as well thought of as it is now. I’m not taking anything away from the film because it was very interesting and well put together and to think that this film was made in 1929 is ridiculous. My favorite part of the film was when the blinds were opening and closing and then the editor made it look like it was the lady blinking. Then they decide to compare it to the camera lens opening and closing and that was just genius. The spilt screens were also a great addition to all the metaphors. This movie basically shows us life and death and everything around that sums up life, like the poor and the wealthy or hardworking people waking up to do their jobs. While all of this is happening it still shows us that the editor is also a hard worker. Man with a camera was a movie I enjoyed watching simply because there was always something coming and the pace. As a viewer you never knew what to expect. For example, at times you would see the camera man climbing or walking somewhere, and then later would see the actual shots taken from the spot he was trying to get to. It also was able to capture humor into it. There where scenes that spoke on their own. The poster that had the man with his finger to his mouth as if it where telling you to be quiet, as well as the signs to let you know where you where. Overall, I enjoyed watching the movie, but I not a cinema critique, therefore I focused on enjoying it more than analyzing it. In my first time viewing the film exhaustion was the first thing I felt. The film lacking a traditional narrative did not allow for the normal more passive viewing that I have grown accustomed to. However, this is no way took away from the overall enjoyment. As you mentioned the life of people in the city then and now in many ways mirror one another. In my first viewing this aspect more than any other got me through the onslaught of visual information. This was actually my second time watching MwtMC. The first time I watched it (and I suppose this applies to plenty of films) was much more surprising. Maybe because I simply don’t expect people of that time period to have such an extravagant vision, to think so far outside the box. As mentioned above, my first time watching the film, I yearned to find a plot line, in the most conventional sense of the word. I then realized that the best way for me to appreciate the film was to forget about conventionality. Foremost, specially watching it a second time, what resonates with me is its creativity. Montage, camera angles, double exposure, split screen, etc. are all incredibly impressing because they seem innovative. I think what appeals most to me is the aspect of the film being experimental rather than a documentary. The setting, a busy city, I think, was mostly a genius choice to display all this magnificent artwork at play. Of course it also speaks to the nature of the city’s workings and its inhabitants, but without the kaleidoscopic eye (as you so perfectly described it), a city is just a city and the film is just a very long moving photograph. A perspective is produced when the aspects of film editing, specially with montage, are applied to the film. There’s a sense of chaos because each shot is so short, which is how most cities behave– they are very fast-paced. However, each individual person that makes a part of this city, are simply living; the chaos that the viewer sees is not chaotic to each individual person. In fact, it is normality.It is the compilation of its inhabitants living, working, and while some are dying, there are others being born, that make the location a city.A bustling one at that, which is important to point out, because since there is no sound, the chaotic shots help it to appear that way. I also wanted to lightly point out, and I just thought of this, of the eye as a camera lens as a foreshadowing or a premonition– “Big Brother is watching You”. Sad to think that in this film, the camera is used a tool to create, but now a camera can also be used to destroy. Strange. Man with a Movie Camera can be looked at as a film that may pose as too much of a challenge for the audience to follow, given it’s wide array of techniques such as the freeze frames, jump cuts, and the stop animation. But it’s these techniques, coupled with the fantastically done editing process, that make Man with a Movie Camera a spectacular film both artistically and technically. Even from the first few shots, where the shot opens up with a camera and then the audience sees a cameraman positioned on top of the camera and beginning to film, were wonderful. What really sets this movie, and more than likely others from the same era, apart from conventional films is not only the spectacular editing, but the overall absence of a story. Audiences now are too used to first,looking at who’s starring in the movie and second, what the film is about, before making a yay or nay decision before going to see it. I think with the absence of a narrative, the film is ambiguous enough to be interpreted in so many different ways by the audience because it doesn’t suffer from the restrictions of having to make a story make sense in a certain amount of time. As for editing, it is really interesting to see editing this fast while also being sharp and well done in a film outside of the action genre. The only question that I have now is whether or not Quentin Tarrantino studied these movies before starting his own career, because I got a vibe of the earliest sense of nonlinear storytelling in this film. Dziga Vertov’s silent film Man with the Movie Camera does fulfill the definition of a film montage. The array of images he uses to create the film relates to everyday life. The critique of Vertov’s film was very accurate. It had a very strong sense of symbolism and metaphors. Although some parts of the film happened without order nor make sense. One part of the film that was very in depth with meaning was Vertov’s scenes of marriage, divorce, birth of life and death. Vertov was phenomenal in conveying messages within the film. A very strong aspect was filming the camera man with another camera because it validated that the images were for its time. Vertov’s film was not really a film of interest for me but for its time made sense. Everyone likes a role bender towards the Russian government. Vertov’s wife should be given considerable amount of credit for editing the film. Had she not chosen the shots she did and worked laboriously to compile them the movie would it not be as well-known as it is? The montage film is not a method of cinematography I would prefer to watch because there is not a lot of structure to it. It was a very original idea to place the camera in different areas which made it so bold. My question is why did he choose the areas he did to make the film? I have to agree with a previous comment.From the moment the film began i felt as if i was watching a video on youtube. It wasn’t long after that, that i wanted to exit out either. There were shots in the film that I enjoyed like the camera under the train or those of the rail carts but that was about. I felt as if there was to much going on to even hold my attention and did not really enjoy watching the film. Interesting points! I’ll admit I was too focused on taking notes in class to really make any cool, unique observations. I will say that I also like the symbolic meaning of Dziga Vertov as “spinning top” and it really fits the movie’s pace and character. In the film, we continually return to a lot of the same shots such as the trolley and town square. A spinning top does the same thing metaphorically speaking since it goes at a fast pace in a repetitive motion before finally stopping. The film went at a rapid pace and repeated many of its effects such as stop motion, split screen, and the Kuleshov Effect before finally slowing down and stopping. Another interesting thing that you pointed out was the idea behind using the Russian people as the “star” of the film. It was a very ingenious, fiscally savvy tactic to use regular people and cleverly edit the footage that was captured of their everyday activities. It felt more genuine too than similar tactics used today to make regular people the “star”, such as contests for being an extra in a Hollywood film. Whereas the example I gave is a recent marketing gimmick, showing footage of couples at a marriage/divorce registrar and juxtaposing it against split screen footage of trolleys converging or separating really gives the feel that this is real life that is being shown on the screen and that it’s not a mere tool for capturing audience interest. 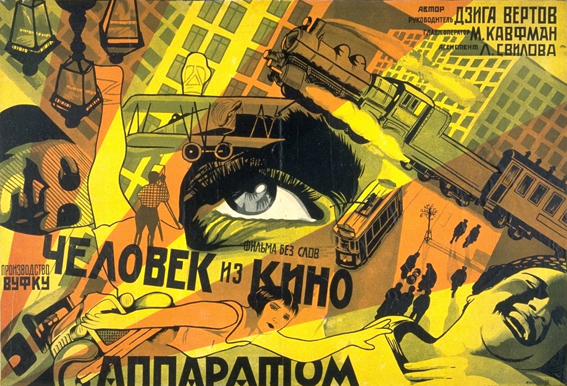 Man With a Movie Camera was a very abstract experimental film of the Soviet Montage genre, very much different from the Hollywood blockbusters we watch today. The shots are extremely fast and there was no conventional plot; however it seems to tell the story of everyday city life. Also it was neat how the family worked together in the production of the film, and how a lot of it was documented in the film itself. The music played a huge part in setting the mood of the film, as it is a silent film. Although there were no words, images of life in the city told the story, many of which contrasted each other. I think today, the techniques used in the film are nothing special. However, 80 years ago, this film must have been groundbreaking. On the other hand, the deep, philosophical ideas will never become dated. Vertov and his wife use the tool of editing very effectively in the film. I enjoyed how to film started out inside a movie theater, showing an audience the film we were watching, and ended with us watching the audience inside the theater. Another interesting scene I enjoyed was the split screen mash up with multiple shots. This to me nailed montage editing because it has many parts to it making it hard to take in everything at one time. Although I did enjoy the film, at times it gave me a headache from too much motion. This was by far the most amazing film I have ever seen in my life. As you said in your essay, juxtaposition plays a huge part in making a beautiful montage. And Vertov’s juxtaposition was unbelievable. The way that he was able to tell such a moving story, when there was really no narrative…I mean that barely even sounds possible. My favorite two scenes by far had to be the scene in the factory that kept flashing back the to scene with the women answering the phones. Had I seen that in a normal silent film, I would be bored out of my mind. But the music with it was so incredible, and the way he shot it was amazing. I love the way the music went with every cigarette box that was folded and every pile of cigarettes that was put into each box. The other scene that stood out to me was the life and death scene. I know this is probably everyone’s favorite…but just the way he was able to capture so many different feelings in a matter of seconds was just unreal. I didn’t even know how to feel. One second it was happy life, then sad death, then happy marriage and sad divorce. He pulls so many feelings out. And the way he made the camera lenses look like an eye. Amazing. I loved all the shots of the movie being shot and edited. It was like he was doing a day in the life of the city and a day in the life of him shooting a day in the life of the city. It was crazy. I really could go on and on. It was a masterpiece. Dziga Vertov had managed to transform quotidian lives into an intriguing work of art with this movie. There are so many things going on in this movie that makes it a little bit hard to draw a single conclusion from it. The editing brilliantly shows the juxtaposition of two different social and economic classes that can be found in any places. Which is interesting, because he shows the differences between people lifestyles while simultaneously comparing and correlating human body parts and people routines with various machines. As if people are more closely connected with lifeless machines than with others. keren.The editing brilliantly shows the juxtaposition of two different social and economic classes that can be found in any places…. First of all great review!! Some things in this movie I couldn’t understand but how you worded it placed things in a better prospective. While I agree that there are stars in the movie I think that instead of the German mass being the star I thought more so that society in General was the star of this movie. I say this because this movie was filmed over the course of 5 years and in those years it doesn’t seem like much change has happened in terms of how people act and do things. Also many themes on the movie such as life and death and life moving at a certain pace in different times of the day is universal. You said someting after class last week that I found interesting. You said that the first time that you saw this movie it made you think that Russia is a nice place to live. This may have been one of Vertov’s motivations in making this movie. He may have been trying to tell foreign audiences that Solviet Russia is a nice place to live with this movie. I enjoyed how he showed everything as is and the idea of a movie within a movie was great. I am not sure if that was done before this movie or not, but either way it was quite innovative. This movie was very active and I am sure that Vertov had not problem getting and keeping the attention of his audience. This was a great movie and you gave a great review. When you first introduced the film I knew then it would be difficult for me to understand. When ever I watch a film i like to focus on the backgrounds, or the extras, basically everything but the main focus of that shot. I agree there were times where i just wanted it to be over but a few scenes caught my eye. I remember when there was music playing while the orchestra was setting up and it seemed like the music was never going to end so it kind of built up the suspense there. I definitely wouldn’t say it was my favorite film but certain parts of it really intrigued me. I loved the rawness of it, and how he didn’t feel scared to put a woman giving birth or how he shows death. It showed how life was back then and through every like or dislike I have about the movie, I have to respect that. I do have a statement/question. How on earth did all those people allow him to film them, especially the women in the hospital. I’m just wondering what was going on through his and their minds while this was going on…. After watching Man with the Movie Camera, I was amazed with his use of montage editing. The way that he showed the city, the buildings, and so many different people’s faces made the movie very interesting. I thought Dziga did a really amazing job. I am so fascinated by his way of editing and showing daily life. Even though technology has drastically change since that time, I still believe that even with the poorest technology you can create something incredible for the audience. Even though I am from today’s generation I am so fascinated by Dziga’s movie. If I feel this way about his movie, being from today, I wonder how people reacted to it back then. Reading professor Smith’s article, really helped me understand the film and the Soviet Montage movement a lot more. It also gave me more of an appreciation for this type of movie. I feel the same way as professor Smith about bringing this movie to Chicago theaters. After watching Man with the Movie Camera, I was in shock with the creative montage editing that Dziga Vertov used in the film. Although I found some of the movie to be increasing boring, the rapid montages are about the only thing that kept me wanting to see more and more what the film was all about. I did not have a favorite part of the film because it all seemed so very fast and chaotic and confusing, but then again that is what intrigued me about this film. In my opinion, this whole entire movie was a form of experimentation in the cinema world during that era and was Vertov’s way of stylizing his film making. From my understanding, this movie is important because it proves that film can go just about anywhere and do just about anything. Vertov’s way of portraying the daily life of everyday people was astonishing (seeming as how technology wasn’t at it’s finest back then). Reading your review on this movie definitely helped me understand the Soviet Montage movement in a greater capacity than before and has broadened my mind on film. After I watched the documentary movie “Man with the Movie Camera.” While watching the movie, I was excepting the title of Movie like the other regular movies but it just start with the scene where there is a man, who is up on the top with movie camera; which expressed the TITTLE OF THE MOVIE and I though it is unique creativity of Dziga Vertov. This documentary does not have any particular subject; nevertheless, it has covered up everything things that happen in our life. The MwtMC of 1929 has the power and strength – “STORY” which is the essential need for any kind of movie weather that in 19th century or now on 21st century. When I was watching the movie, I feel like “Ohh, this is boring” and continued watching till the end and I felt “JUST WOW!” Someone has mentioned something like all the audiences are the actors in the movie; well I agree, there isn’t any particular actor/actress playing roll, but there are thousands of citizens and their daily bases life story. The perfect shots with the perfect timing through the different angles, I believe there must be at least 3-4 cameras for this MONTAGE. Couple of different Scenes presented together with the contrast. Examples as per the movie: there is crying baby on side than there is also a happy adult, A birth of child and a death of a woman, A happy couple getting wed and a sad and depressed couple getting diverse, A rice and a poor, and etc and etc. There is no action, no play just a simple regular story of citizen. Likewise, how a woman wakes up, get dress- gets ready and start her life. It does not have any tragic start or happy ending or other way around because there isn’t any script, it is just a simply life of our, the audiences and their, the directors and producers. Overall, I liked the movie very much, how Vertov has had present a whole life of men in hours of movie, highlighting the Soviet Montage Movement. One of the many parts I found amazing was when his wife was editing the film. Stills of the film strips were shown and then brought to life.It shows how incredible editing really is. His wife was a trooper because that was, I believe 3 years worth of film that needed to be edited. I also loved the how the editing created compare and contrast scenes. For example, a woman is shown getting a manicure while the next shot shows women using their hands for work. This film should be watched an endless amount of times because there are new ideas a viewer can create each time. I believe it takes more than one time to digest a film such as this. Also, have you seen The Story of Film:An Odyssey and is Soviet montage mentioned? Someone recommended that documentary to me. I own The Story of Film on DVD and frequently show excerpts from it in class. Yes, it does cover Soviet montage pretty extensively. The whole thing is 15 and a half hours long so it’s pretty exhaustive! I highly recommend it. I really didn’t get the whole montage ,but you broke it down in your screen report that help me to understand what montage mean. It was great to see the many shot from different angles ,it was like one big puzzle of montages the circle of life was the best montage. The movie also show great creativity for that era of movie making. I agree that movie today should bring back that syle of movie making. It seem as if he was one with camera you don’t have that kind of movie making techniques in today’s movie making. First of all, I will like to say great,great Film, I agree with Professor that “Man with the Movie Camera” is revolutionary because I can strongly argue that Vertov experiment is the blueprint to many multi-million ideas lately; a very good example will be instagram (IG) where users have 16 seconds to make a video, mostly about their city,themselves or anything. In addition, his experiment is very lucrative now, just ask creators of IG and if he they copied from him, there should be some sort of mechanical royalty for his family. There is something about the “Evergreen” statue that everyone seem to agree on. Even though the shot were short, yet they were effective shot that captured the essence of life back then but amazing still relate-able nowadays. Honestly, I believe he was saying “everything is Cyclic”. From Humans being born, marriage, divorce and die; on the hand machines following the same trajectory as human. I am still dazed that he did all this without a story/plot. This film seems like a firework show but on a screen of shots. This was an interesting movie to watch but really didn’t know what to say about it. I do agree that the film does have two main characters, the camera man and the people of Russia. You can defiantly see Dziga Vertov passion of the camera from the multiply shots of the camera man to the eye in the camera lens. He also shows how that back then that the camera can go anywhere and even put itself together and do a silly dance, which I loved. The film was blast of energy from the camera man of the motorcycle to the under the train shot which was one of the fascinating shots I saw in this film. My first thought after your introduction in class and after watching Man with the Movie Camera was did they plan this? In the movie the clips go hand and hand and are mostly opposite shots; birth death marriage divorce, etc. So it made me wonder did Vertov film a marriage then say now I have to film a divorce? Was he trying to tell us this story, or did he just film alot of different things going on around the city and then his wife Yelizaveta decided after watching all that he brought back to but those sciences together. I think its very clever that shots of her editing the film is literally apart of the film. “the central ideas behind the city symphony films is that the people who live in each particular city form a kind of collective hero for the movie.” Who would that hero be? “Russian people captured by the brothers Kaufman and their movie camera over eighty years ago are not so different than the Chicagoans I see and interact with every day. ” This statement was an eye opener to me. For me Man with the Movie Camera was not this miraculous movie how critics viewed it. But I just figured what do I know, Im not a film maker and I haven’t even seen movies that are considered classics. I thought maybe I was missing it if this movie has stood over 80 years as one of the best. Then this comment brought it to me. This movie is timeless. What we see in this movie is pretty much what you will see today in the city I live in. Ofcourse there would be minor changes like clothing, and different technology and transportation but still the citizens would all be doing the same things that those citizens were 80 years ago. Waking up, going to work, giving birth, etc. And I think that is one of the reasons that this movie is labeled great. From what I know in music timeless is good, if someone can play a song that you made 30 years ago and can relate to it, its labeled great. And that apples to this film it’s relatable. It’s life, literally. Thanks for the detailed reply, Dzhonea. The concept of a “collective hero” means that ALL of the Russian people, taken together, are the hero rather than having a single individual be the hero as is the case with Hollywood films like Our Hospitality. First off i must say that if i wasn’t for warned about this film i would have been utterly disappointed. But now that iv watched it it looked like a bunch of pointless pictures an shots of random people doing random things including the camera man, when he was taking a bath in the beach water. As i continued to watch the movie i realized that it has way more of a meaning that it seems. For example when there were shots of a woman throwing mud over a wall then the scene would switch to a woman getting make up put on her face. i felt like it had a couple of different means one was a woman working hard and the other is getting pampered, one woman is throwing mud but it looked like she was throwing mud on the woman face in the next shot because the make up was dark. I believe it makes perfect scenes when Vertov says “montage is an idea that arises from the collision of independent shots.” Those independent shots had there own meaning but were all connected in some way. I honestly feel like the average shot length of the film was not 2 and a half seconds i feel as if it was longer im not sure if it was because of the was he put together the scenes or was because he showed similar scenes multiple times. I believe the film captures montage in an unexpected but deep way because montages are usually a short clip in a movie not a feature film. Also the things Vertov were shooting were not randomly filmed. My personal favorite part was when he show the couple getting married divorced a woman sick in a hospital bed and the woman dead being pushed in the street. My first idea was he was showing examples of pain and death but I couldn’t understand why he showed the couple getting married because that was a good thing until i found out that the sick woman wasn’t really sick, instead she was having a baby then it hit me maybe he is trying to show the cycle of life happiness, disappointment, sickness, death and birth. First I would like to say that i am so relieved after reading your essay on the film. I thought i was going crazy when I would see things that I couldn’t make sense of, such as when someone was filming another person filming something else. I don’t mean to be ignorant but I truly didn’t know that this was an idea that was thought of during that time. I wasn’t sure what the point of that process was for and it really confused me. My overall feeling when I finished the film was confusion. I know thats not something that you want to hear from reading your responses to other students entries but that is the feeling that I initially came away with. I would also like to add that after reading your essay I do understand why people consider this a great film. I now understand how fascinated that this director was with editing. That is so clearly the focus of the film. I was constantly jumping around with ideas on what each individual picture meant and I didn’t truly understand the point until the very end. At first I thought that all the people doing their daily rituals made no sense to the purpose of the film but afterwards I gathered that it was supposed to paint a picture of that time and place and to show others that aren’t from there how life was for these particular people. Now I must admit that I do not understand this film to the extent that a lot of my classmates do but after reading your essay and reflecting on what I’ve seem and trying to look at it from a different point of view I can see the meaning and how people consider it a fantastic film. One more thing I would like to add is how much respect I have for all the people that made this film. In those times it was so much harder to edit films, you couldn’t just get on your laptop and play with iMovie. So I can’t imagine how much time and effort it took his wife to edit a film like this especially since like you said the average shot length is about two and a half seconds. Thanks, Lauren. There’s nothing wrong with admitting you felt “confused.” I want everyone to be honest. I just don’t want detailed descriptions of one’s feelings to be the *main* *thrust* of these comments! Which wasn’t the case with your response. For the purpose of this class, I think it’s important for us to go beyond the knee-jerk “I liked it”/”I didn’t like it” responses and try to turn our subjective impressions into more objective statements about what these films are doing (regardless of how we might feel about them). After watching, “Man with the Movie Camera” I was really intrigued by the way the film was showed and flowed in a very different and unusual way. For me, it was unusual because this was the first time I purely watched a movie that was this quick and contained multiple shots going at a fast pace for the entire screening. However, as the film went on it kind of slowed down to me as I came to appreciate and really like the unique and amazing style of work that Dzig Vertov had created during the 1930’s. One of the things that really stood out to me from the film is the way the film kind of compared daily lives of human beings that live in the environment of the city, to filmmaking. To give some examples, one that stood out the most for me was the fact that certain shots of an eye and shutters were shown in a montage to possibly indicate the connection that both technology and the human eye has with each other. Technology and the connection with everyday life was something that stood out to me as I watched as well. I felt like Dzig was trying to show the audience that the growth of technology during that time was really big. There was a scene where a radio was shown with the piano playing inside of it, and then when there were still shots that showed a horse, carriage, and a car showing the progression on technology. In my view, I think this also showed how life during the 1930’s was really moving fast as people were trying to find their place in society. The film showcased some contrasting shots of people who looked poor, as well as those who looked more well-off. This film makes you really think about what is going on when it comes not only to how life may have been back then but as well as how the filmmaking process is as a whole. It gave a great insight as to how movies were made back then, and showcased the amount of effort and hard work that is put in to make a film. This movie really made me try to interpret the overall sequence of shots that are being presented to the audience, and it is a film that I thought overall did a great job at making you wonder and approach it through various ways. 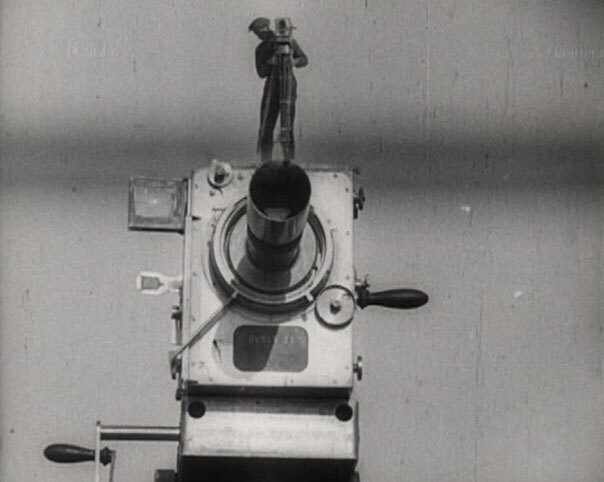 Dziga Vertov’s Man with the Movie Camera is a unique film that reveals the interesting nature of montage editing. There are many qualities of the editing style that make the film great. It is interesting to see how Vertov was heavily-focused on the mechanics of filmmaking, including cinematography and editing. The structure of the film can be considered stylized and different. One of the ways in which this is evident is during the scenes that include the people working in the city. Each of the characters that are filmed are living unique lives. Watching the filmmakers show countless strategies in regards to camera position is very intriguing. For instance, watching one of the cameramen run up a bridge was pretty funny and revealed that the filmmakers were driven to get great shots. It is also interesting to know that the film has an average shot length of less than two and a half seconds. The movie felt very fast-paced, even with the absence of a traditional narrative. There are a lot of contrasting ideas that are shown. For example, marriage and divorce are displayed one after another. Life and death are shown one after another as well. It was also interesting to see how different individuals reacted to the filmmaking. Some covered their faces, while others did not seem to show much interest. In my opinion, one of the important qualities of the film is the idea of routine. There are many moments showing the lives of men and women who live in the city. It reminds me of the concept of the movement of water. While there are scenes in the film that felt slowed-down, the scenes afterward felt faster, symbolizing routine and the relative usual. The montage sequences are assembled in a way that makes the film compelling to watch. All in all, Man with the Movie Camera is an interesting film that reveals the unique nature of montage editing. The short shot lengths, fitting music, and cinematography add to the particular qualities of the movie that make it great. After watching the film, it was very easy to feel overwhelmed by the imagery and just the amount sensory information that had come in the last hour. While it was almost like rapid fire shots, the editing made flow smoothly from shot to shot that there was time to get hung up on a scene or risk missing imagery of the next three. Throughout the film I was able to take away from it a reoccurring theme of everyone and everything constantly being in action. Even before the work day had started, people waking up whether in there homes or on the streets people where moving themselves forward to start the daily series of actions that make up there day to day lives. As the film went on the level and intensity of action in the urban environment only increased. People flooding the streets on the way to work, trolley cars leaving the hub and overtaking traffic. Whether people were in cars, on foot, or working on a train, they were in action, and never stopping. This theme of constant action would have stuck out to me if Vertov had stopped at just the day to day life of the city but he included such powerful images that wouldn’t be thought of as typical activities like waking up, getting dressed and commuting. The series of scenes that show the marriage license being signed paired with the signing of divorce papers and then the images of childbirth along with that of a funeral procession invoked a deeper meaning to this idea that people are always moving always in action. Even when something is just beginning or after it has ended, people are still taking action in doing so. And beyond the people involved with those events life for everyone not involved in ‘birth’ or end of something still goes. While most of my notes followed this idea of everyone and everything staying in action even death, something I wrote that still sticks with me is something put down about halfway through the film. After 30 minutes of nonstop images of all different scenery, people, and even the sequence of still shots, it felt as if no time had passed at all. I’m not sure if Vertov meant to have this effect on the audience, but it made correlate my other notes about everything being notion with idea of If we are constantly busy and never stopping, things will flash right before our eyes. These 3 second frames didn’t give me time to enjoy the beauty of Urban Russia, or stop to process how wonderfully different technology and life where in 1930s. Instead I was taken aback by nonstop imagery that cut together and edited so intensely that and all I was left with were notes about how intense and fast paced urban life is. The hustle bustle of an urban environment help this movie stand the test time because regardless of technology people are always racing to get things done in the work week. The nonstop montage was 69 minutes long, but represented an entire day in the life of Urban Russia, yet it was shot over the course of years. Years of work that for me passed by with a blink of an eye. I think I need to lie down after making that strange connection in my head. Before watching Man with a Movie Camera, I was very skeptical about whether I would enjoy the film because I honestly thought that it was just going to be a film with music in the background with a bunch of random shots of different things put together with no meaning. However, I actually ended up enjoying the film and realizing that there technically was a narrative. The narrative being a story about the normal day of a city. And in the normal day of a city, all kinds of things that happen throughout life are shown in the film such as birth and death, marriage and divorce, and work and play. And as you mentioned Professor Smith, how Vertov puts contrasting shots next to each other, to me is very symbolic. I believe that he is trying to suggest that there has to be a sort of balance in life. The interesting thing is that Vertov not only does this through putting shots that depict opposite things together, but also it seems that the music that is supposed to be played with the film is also suggesting that balance because the music matches exactly the type of emotion that is depicted in that specific shot, such as the contrast of music between the marriage and divorce shots. Also, as a side note, I feel that the tempo of the music really matched the pace of city life. Which leads me to another point, I remember that you said in class that Vertov left specific instructions on the type of music that should be played throughout the movie, which I found very interesting because I am assuming that almost all silent films up until that point had no specific instructions or official score. This makes me wonder if Vertov was one of the first directors to have somewhat of an official score attached to their film. Back to my previous point, I believe that Vertov was truly trying to capture the cycle of modern life. Because he feels that the camera lens is exactly like the human eye, and the human eye captures events throughout our whole lives, Vertov was in a sense, trying to almost create a recap of what an average person in the city might have seen in their life. Because of this, I feel that if someone rearranged the shots in the film with the first shot being the birth scene, and the last shot being the funeral, and all the other shots in between, together, could possibly create a whole new movie that depicts the life of an individual person. To conclude, the film is pretty overwhelming the first time you watch it, and I feel like I missed so many things. I am sure that if I re-watched it, I might have more to add on my analysis or perhaps change something with analysis. This film is truly unique and it really makes you think and try to put a story together in your head, and I think if you are open-minded enough, then you will definitely enjoy the film. Watching this film “Man with a Movie Camera” I can honestly say this film has all the types of movie genres. Such As comedy, drama, action, and even horror. One scene that stuck out to me the most was when we see the women editing the movie. This caught my attention which made me watch the rest of the film in a very different way with a new outlook. We start off by watching the montage of the film and then all of a sudden we start to see still images appear. Along with that we hear the tempo change from upbeat to dark and scary. With these still images it appeared to me as if time had stopped for a brief moment. As this happens we start to see the women editing the film within the film. It was odd to see and it felt like I was watching two different films. As we watch her edit the film and pasting certain scenes together it occurred to me that she could have done these scenes differently. She could have put a few beginning scenes at the end and visa versa, but she chose to do it this way which really intrigued me. why would she choose to do it this way? I feel as though she had used her own personal outlook on life to help her edit the film. I personally felt like she was a god and she was editing parts of peoples day to day life the way she saw fit. This scene did freak me out a bit, but made me see a whole different movie from there on. This style of film making can be very overwhelming especially when it’s done like this, but Dziga, his brother and his wife did an incredible job. I know this film is hard to relate to and your not suppose to relate to it, but to make it your own. The viewer is the narrator and the man with the camera is just helping you see the world. I often felt my life is a movie and I choose how to edit it and watch it through my eyes. Anyways back to the film, The fact that they were able to shoot Vertov while Vertov was also shooting the movie that we would see later helped me understand how they got those shots. For example the train scene in the beginning where he is standing it front of it and then was able to get shots all around the train I thought how was that possible? then a few moments later we see how it’s done and that really caught my attention throughout the film. All in all, I recommend this film to everyone because it really opens your eyes to things that you might not have noticed before in films today. When I first heard that we were going to watch Man with the Movie Camera, I thought that it was going to be an entirely new experience. It was not until right before the movie started, that I remembered I had seen it before in a video editing class I had taken at DePaul. When I first saw the movie, I was left confused and a little annoyed that ‘I didn’t get it’. However, after watching it the second time and the discussions that was made in class, I felt as if I understood a lot more than I previously had. I realize the key in understanding montage films is not the individual shots on their own, but the editing and merging of two or more shots. What I saw from watching the film the second time was how urban life is the convergence of experiences. It is a clockwork with each moving piece having its own purpose. What this film did really well was portraying that feeling of slight overwhelmingness of urban life to the viewer. The editing and timing of each cut being so fast paced even further exemplified that feeling of being overwhelmed. The film really reminded me of the first time I had gone to the city after living in the quiet suburbs all my life. You see shots of people waking up and going to work. It almost felt as if these people were living their life on a loop, and that they were on constant autopilot. With that being said I do not think this is inherently a bad thing at all. Whenever we think of technology taking over our lives and being at the very center of the things we do, it’s easy to say its bad. I think that idea is wrong and that the film was not trying to portray it as bad. I have a sort of digital triumphalist view when it comes to technology. I think that as technology progresses, and becomes more immersed into our lives, that we would live happier. I feel as if the film is trying to show the same thing. When we see the shots of people working, repeating the same tasks over and over they don’t look sad at all. In fact, they even show shots of them smiling. Then after work, they all go and have fun watching sports or swimming at the beach. My ideas for this film feel like they are all over the place, but then again so is this film. Although it may feel chaotic at times, Man with the Movie Camera is a cinematic masterpiece. I have to say the film man with a movie camera was one of the most outrageous films I have seen. Starting out I thought the movie was extremely weird and random and that impression has not changed after completing the movie. The movie was basically about a camera man filming another cameraman who was the star performing crazy stunts to film basically everyday life. I can honestly say it is the type of movie I would never find myself voluntarily watching, so on that aspect it was a positive experience to see something different. Even though the movie was different, it still had many interesting things in the film such as I believe deeper meanings hidden in some of the compilations. The film captured everyday life in Russia and made regular activities look exciting mostly due to excellent editing even though they did not have the technology they have today. I wouldn’t say I completely understand the film, but I believe that’s the point of it for you the viewer to come up with your own reasoning behind it. A man with a Movie Camera can be looked as a silent film that defines a film montage. This film has so many great editing by his wife because she put so many time and effort into picking on which film to make it perfect. The music in the background that Dennis wanted in the future that came out in the 90s that was put on after for this film was excellent by eight gave that is a mystery or some creepiness in my eyes I thought the whole film with the music was perfectly arranged on each scene. The film also showed how it was five years in the making, but it felt like it was maybe a couple of days the scenes were so correctly made. How at the start it was in the morning where there were no people in the middle of the day where there were friendly people and then at the end of the day where there was a ton of people everywhere. He used the camera lens with the cinema eye at the start and the end of the film. Denis showed us all the angles that are so different than other silent films. The people in the film look so different than I thought they acted back in those days. The best parts were the still photos that showed people and objects frozen in time, showing us all the details. It was crazy how Denis and his brother went to the best to shoot the film. Like how Mickhail got shots in the car, bike, and dam scenes looked, so dangers just to get some scenes. Elizaveta is removing and gluing the scenes together to get the perfect scenes in the film. Denis showed us a montage could be anything. Can’t believe this film is still so popular. Man with a Movie Camera was incredibly unique compared to the other films shown in class. Something that makes it very unique is that there isn’t necessarily one story line to follow all throughout. We are shown just a montage of life in urban Russia and we create our own perception as the viewer of what every shot means to you. Another aspect that makes it unique that was quoted in the article is that the film is “an experiment in the language of pure cinema” which is shown as Dziga Vertov’s brother and wife are shown in the film working on the film itself showing how “pure cinema” works and gives you an understanding of how shots are taken and how the editing is pieced together which doesn’t come to mind in other films viewed in class. The editing allowed a smooth transition between shots taken and had the “1+1=3” aspect all throughout the film leaving a big part of the story telling perception to the editor to be in charge of. Overall, I enjoyed it because of its simplistic idea of the time to just film life happening and presenting to people. If a modern version was made of that today in a big city like New York, Chicago, or Los Angeles; I would be interested in seeing it even without a straight-forward storyline. After watching “Man With A Movie Camera,” I was really impressed on how the rapid shots came together and produce these masterpiece. I noticed how the movie doesn’t show any suburbs area, it was all in the city. It is a good way to portray a life in a city, something is happening every second of the day. Another thing I also noticed was set of shots together. When the shots of people at the barber shop and salon, and other pics were of hard working people. I took away this, that the rich people would hire someone to do their haircuts, or go to a salon for a facial, where on the other hand the hard working people were shown the way they were. Their clothes ripped and with holes. I got to this meaning by Dziga’s formula of “1+1=3” two shots conveying their own meaning and also giving a hint on the next scene. I really enjoyed the parts of movie which had been shot once, but also to be used elsewhere. For example, Dziga’s wife is the editor for this movie and she has been seen working on this film while getting by the man with a movie camera. After watching the film Man with the Movie Camera, I have a greater appreciation for montage films and how two shots can become three meanings. I think it is very interesting how people can interpret the film differently. This would be a great film to watch and pause throughout in order to reflect on the fast paced shots because you might be able to find another hidden meaning that gets lost throughout the film. In addition, I really liked the scene where it turns to still shots and then you see the lady cutting and organizing all of the film reels. That gave me a better insight in how films were made and how making this film took a lot of time and hard work. It wasn’t so easy like it is today, filming shots and then putting them in a movie editor to edit the movie. This film was by far, one of the most interesting films I had ever seen. At first, I didn’t understand what Professor Smith was talking about when he said that there is nothing like it. Being one of the first montage films, it still captured the essence of everyday life in Russia. One point that I found interesting in the essay is when Professor Smith was discussing how even though the film has no set plot or context, there still seems to be two main characters, the Russian people and camera man Mikhail Kaufman. Due to his daring stunts and drive to get jsut the right shot, it seems as though there is a flow to the movie. I think that this was a very smart move on Kaufman’s part because it allows for the viewer to interprets the “story” in what every way they seem fit. Even though it is full of chaos, the film still seem very smooth and calculated. Man with a Movie Camera was unlike any other movie I’ve seen. There is an unusual silence to this silent film. The lack of screen cards, that actually describes a narrative, ceases to exist. Because of this, the viewer has to use their intuition while watching the film, in order to pick up on their own interpretation of the story line of this film. What’s really interesting about this film is the editing. This film was an entire display of montage editing, showing picture after picture of people, Russian scenery, and cameras, which leads you to experience a very different way of watching films. I thought that Dziga Vertov and his wife and brother, did an incredible job of leading your thoughts to pick up on the 1+1=3 style of editing as well. He was able to take different shots and flash them back and forth in a style that made you notice the link between each individual shot meaning, such as towards the beginning of the film, when the lady is waking up and you see her blinking then it flashes to the curtains opening and closing and then to the aperture in the camera lens letting in more and less light. The movie was simplistic with a complex meaning. I was really able to expand my interests in this film. The film Man with a Movie Camera by Dziga Vertov, is about the urban life of individuals in the Soviet Union. More specifically, the film doesn’t have a plot, characters or screen directions. Instead, the film consists of a barrage of images spliced together. The film is most famous for its cinematic technique such as jump cuts and splits screen which in turn help make the film a a montage. According to Sergei Eisenstein a montage is an easy scene in which the meaning arises from the collision of independent shots. The director Vertov uses the theme of montage to convey the relationship between consumption and people which in turn helps define the meaning of cinema which is essentially the mass consumption of images. Vertov uses the dissolve technique to show a change in the passage of time, which in turn reflects the mass consumption of images. For example, the dissolve technique is employed in the last scene of the film where there is an image of an empty beach scene and then a group of individuals doing aerobics on the beach. After the film dissolves to a man unfolding a rug on the ground and placing rocks and singing bowl. Then, the film dissolves to an image of two individuals doing front stoke in a lake. Vertov also employs the technique of slow motion to show the rapid change in action of a single which in turn reflects the mass consumption of images. For example, there is a scene in the film where a women pirouettes across the screen and throws a discuss. The slow motion technique is used show the evolving progression of action. More specifically, it gives a realistic view of the hurling action and gives viewers a close up view of the fast paced action. Lastly, Vertov uses the double exposure technique in the later half of the film to show two images overlapping each other which in turn show the rapid ingestion of consumption. 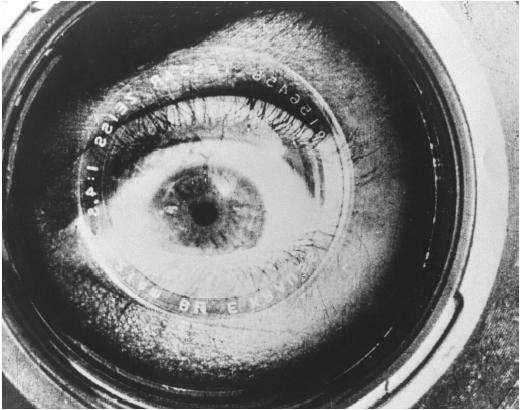 For example, in the film, Vertov shows an image of a cameraman and then places that image inside of a pint of beer. This scene demonstrates the nature of film itself in that there its purpose is to show the relationship between people and consumption.